A new essay, a new podcast, a feature on social entrepreneurs as well as a huge new event in June to share your stories, there's loads going in Big Local despite the snow! We’re taking a break from Spring Events in 2018. Instead, for the first time ever, we’re inviting all Big Local areas to come together in one place for two days of excitement, activity, storytelling and inspiration. Find out more and if you're interested in attending contact us. Let us know what you'd like to see at the event by filling out this short survey. Are we doing all we can to support entrepreneurial people in communities who make a genuine, lasting difference? 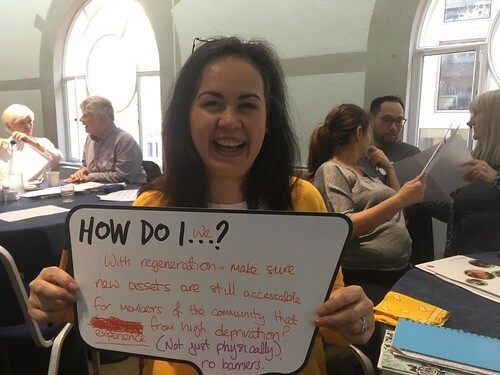 UnLtd's recent conference in partnership with Local Trust, attended by Big Local areas from across the country, raised this challenge and sought answers from communities around the UK and overseas. Read the blog. Following on from our announcement last month about the introduction of new learning clusters for Big Local areas, we have updated information on location and format - thank you for your feedback. Find out more. The Local Trust and NLGN are conducting a research into the challenges and future relationship between councils, local communities and Big Local areas. As part of this research, we will be holding a workshop to explore these issues. We encourage you to share your experiences and join us in the discussion by signing up to attend this workshop which will take place on Friday 8th of June at the Birmingham Library from 11am to 4pm. To sign up, please send an email to rsvp@nlgn.org.uk. We’ve been commissioning independent thinkers and writers to go out to Big Local areas and explore big ideas through the lens of local areas’ experiences. The latest is by Julian Dobson, who writes about aspirations and achievements of Big Local areas in Merseyside, Lincoln and Telford, placing them in the context of previous experiences of community development, decline and revitalisation. Read the essay. Read the blog. This month, we released our first ever Big Local podcast! Narrated by Julian Dobson, author of the essay 'New seeds beneath the snow?' it explores issues highlighted in his recent essay. It’s our first go at something like this and would welcome your views and feedback. Listen now. “I really think Diamond Park is a special place, it’s peaceful and warming – which isn’t something you’d expect to see in the middle of an area like Birchwood. I think the work we’re doing is a great way to capture hearts and minds in the area." Yvonne Griggs went from being a dog owner dismayed by the state of her local park to chair of Birchwood Big Local’s parks and green spaces subgroup. She's also featured in Julian Dobson's essay. Read the blog. Read the newsletter to find out which Big Local areas have been in the news, our Video of the Month. To avoid missing out on future updates, or to contribute to the newsletter, please contact us.